It’s the tree of life, and for no particular reason, either. As a corollary to Biggs’ “cable companies are doomed” article from earlier today, I thought I’d demonstrate how easy it is to accomplish what he was threatening. That is, live a happy and successful life without having to pay $100+ a month to Comcast, Time Warner, DirecTV, or whomever. (Note: I’m neither happy nor successful, so this advice is spurious at best.) Here, I’ll teach you a pretty basic method of automatically downloading things like TV shows, and movies, and whatnot from Usenet. Yes, this breaks the first rule of Usenet; sorry. What? Today we’ll be setting up our Usenet software to look at an RSS feed. (You can also accomplish pretty much the same thing using BitTorrent, but BitTorrent is so plebeian.) This RSS feed will carry NZB files that, magically, point your Usenet software to the actual files you’ll be viewing in VLC or MPlayer or whatever. In English, that means when you come home from work or class you’ll have the latest episode of The Ultimate Fighter all ready to be watched. • A Usenet provider. The big ones, off the top of my head, are Giganews, Newsdemon, Astraweb, and Supernews. You’ll be spending around $10-$20 a month for access, but that gives you access to all the riches that Usenet provides. In my experience all these services are more or less the same, so feel free to shop around. I have no favorites. • Usenet software. The easiest to use for our purposes here today, once you’ve set it up, is SABnzbd+. It’s free as in freedom and free as in beer. • An NZB site that provides an RSS feed. I’ll be using Newzleech.com as my example, but pretty much every NZB site out there should do this. Maybe, I don’t know. 1. With your Usenet account in hand, go ahead and download and set up SABnzbd+. It’s not hard, but I’m not about to hold your hand here. It basically involves launching the application, putting in your Usenet account info, then pointing the application to a few folders. If you can’t figure this out then the rest is probably too much for you to handle anyway. That’s your RSS feed. What that does is comb the Usenet group alt.binaries.multimedia (that’s the “g” in the URL) for the last 50 posts (that’s the “n”) containing the phrase “the ultimate fighter s10” (for season 10 episodes; that’s the “s”). The RSS feed is updated every 20 minutes. 3. Go to SABnzbd+’s settings (Config:RSS) and input that URL. 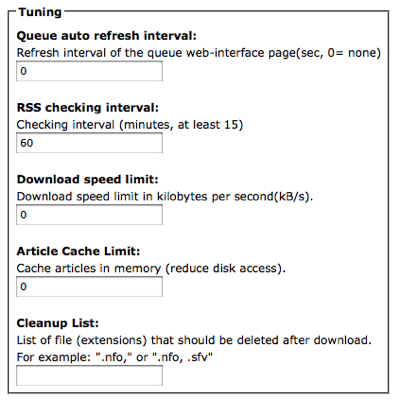 Then set the RSS checking interval (Config:RSS checking interval) to something reasonable, like once every 60 minutes. Under no circumstances should you set it for anything more frequent than every 20 minutes, since that’s considered uncouth, and your IP address is likely to be banned by Newzleech. You don’t want that. Now what you’d do, I guess, is launch SABnzbd+ Wednesday morning before you leave your house. If it’s set up like we set it up here, SABnzbd+ will check alt.binaries.multimedia for news posts containing the phrase “the ultimate fighter s10” via the Newzleech RSS feed. When SABnzbd+ finds the new posts, it’ll download the appropriate NZB file, then start doing its magic. In other words, as soon as the latest episode hits Usenet, it’ll automatically be downloaded to your computer, Internet connection speed notwithstanding. Of course, you can add as many RSS feeds as you want, with whatever parameters you want. Maybe you like 30 Rock, or want to see Louis CK on Parks and Recreation? Or maybe you like Curb Your Enthusiasm? To quote that Nas song, the world is yours. The purpose of this here article was strictly educational blah blah. Now I’m off to rip the copy protection off a DVD I BOUGHT FROM HMV WITH MY OWN MONEY! What a pain.